The Panthers set many individual marks. For the Whitman-Hanson Regional High girls’ indoor track team, the record wasn’t there, but the effort was. The Panthers, despite an 0-5 mark on the season, did what they could. George credited the 0-5 campaign to a lack of depth. The Panthers had nearly 40 participants, which is low compared to the rest of the Patriot League. The Panthers did still have their share of wins, even if they didn’t show up in their record. Junior Courtney Woodward was one of many bright spots for W-H.
Just a sophomore, Izzy Amado was a key contributor. 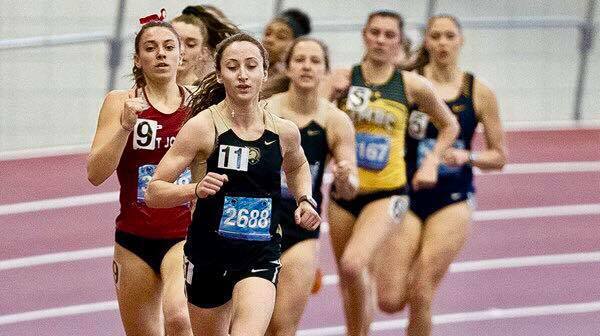 Amado’s classmate, Anna Sullivan, was also strong in bevy of events and is another spring track heptathlete. Senior captain Ally Bartlett was W-H top points getter, scoring in nearly 40 percent of the team’s points. George said his vision for the program remain unwavered. “The goal is to increase participation and with more athletes, achieve greater success in competition,” he said. “Our kids are out there spreading the word that track is not all work, it can be a lot of fun, too. The wrestling team finished with a 7-20 mark, but was white-hot in the homestretch. Whitman-Hanson Regional High wrestling coach Gary Rabinovitz is coining the 2018-19 season a success. For the Panthers, who finished the year with wins in four of seven matches, despite their 7-20 mark, they made progress. They sent three wrestlers to state tournaments, as opposed to zero last season, had a sectional finalist and their first tournament champion in two years. Sophomore Damari Goldsmith-Greene (138 pounds) was a standout for W-H all season long, collecting a team-high 29 wins, placing in four tournaments and finishing seventh at states. Rabinovitz credited junior captain Steve Brooks (152), who missed 17 matches, with providing the Panthers with their first high point of the season with a win at the Weymouth Tournament on Jan. 12. Junior Bethany Ralph provided the Panthers with another high point, finishing second in the first ever girls’ wrestling state championship. Freshmen Jason Rapoza (13 wins at 182) and Rocco Ruffini (10 wins at 220) gave the Panthers a quick glimpse into the future. Junior captain Tyler Cullinan boasted 19 wins, 12 of which came by pinfall, at 160 pounds. Rabinovitz said togetherness was his team’s strength. Sophomore Matt Butler, who was second on the team last season with 16 wins, was held to just 7 matches, in which he was 6-1 in, due to injury. As for the future, the Panthers will return 12 of 16 tournament place winners and Rabinovitz said he has high optimism for the 2019-20 season already. Maddie Soule, a four-year player, will enlist in the Army after hockey season. Maddie Soule’s importance to the Whitman-Hanson/Silver Lake high school girls’ hockey team doesn’t show up on the stat sheet. The senior defenseman from Hanson has one point this season. It was a goal back on Jan. 27. Soule’s niche is elsewhere. It’s her leadership. Soule, a team captain and four-year varsity player, has seen the highs and the lows of the program. After winning back-to-back SEMGHL titles in her first two campaigns, the team has collected just five wins since, as it undergoes a massive rebuild. She is one of just three seniors on the roster. “I just feel like people take me more seriously because I’m all business,” she said. With a passion for leadership, coupled with hockey, Soule will head into the Army after she graduates in May. Her training kicked into full gear in the fall. “I met with my recruiter at 5 a.m. at the track at the high school and we worked out,” Soule said. Being a hockey captain also works to her benefit. Soule said her memories as part of the WHSL girls’ hockey team will be everlasting. Soule said she hopes she left a permeant stamp on the hockey co-op. “I kind of helped build the program, my freshman year it had just started, so I feel like I was part of starting it,” Soule said. Both Whitman-Hanson basketball teams will play in the tournament. For the third straight season, Whitman-Hanson Regional High’s boys’ and girls’ basketball teams have clinched playoff berths. This is also the fourth time in the last six years both W-H basketball programs have earned a spot in the postseason. It’s almost always a sure bet veteran coach Bob Rodgers will have his team in the postseason no matter who it’s tasked with replacing at the season’s outset. The boys clinched their spot on Jan. 29 with a 67-57 victory over Scituate at home, giving them their 11thwin of the season. “I’m always happy for the kids when we clinch a tourney spot because it’s such a special experience,” said Rodgers. Senior captain Joey DePina paced the Panthers (16-6) with 16 points, while junior point guard Stevie Kelly tossed in 11. “Joey DePina has been the heart and soul of our team,” Rodgers said. “His leadership has been instrumental in our teams success. He is such a great teammate who is loved and respected by everyone on the club. The Panthers have been buoyed by a balanced attack all season. Rodgers said his club knows exactly what it has to work on. “Overall our team toughness and rebounding is an important part of the game that we have to improve,” said the coach. The Panthers will aim to keep it simple in the playoffs. It’s taken a complete team effort for the girls’ basketball team to clinch a spot in the tournament for the third year in a row. Jenna Olem’s club (12-8) picked up its 10th victory Feb. 13 with a 53-44 triumph over Silver Lake behind a monster 18-point, 15-rebound effort from senior captain Kathryn Dunn. After losing senior captain and point guard Erin Leahy in the first practice of the year, the Panthers have been piecing it together. W-H has relied heavily on its defense (allowing 41 ppg), as its offense has been inconsistent at times, averaging 53 ppg in wins and 35 ppg in losses. “[We’re working on getting off to better starts offensively in the first quarter, knowing how to close out teams when we have a lead late and rebounding,” Olem said. “Pull an upset in the first-round tournament said,” Olem said. The junior is Whitman-Hanson/Middleboro’s top point getter this season. Entering the winter of her freshman year, Maddie Navicky was certain about a couple of things: she enjoyed competing and she loved to swim. However, she had never mixed the two. That was about to change. Trying out blossomed into of the best decisions she has ever made. Now a junior at Whitman-Hanson Regional High, Navicky is a two-time South Shore League All-Star and back-to-back team MVP. This season, she’s WHAM’s top scorer and a sectional and state qualifier, which are both firsts for her. It’s that type of attitude since Day 1 that’s sparked Navicky’s success. Not only did she leap a lane, but she developed a deep-rooted passion for the sport because of its competitiveness. After all, she did run cross country in the fall. That quality improvement flowed into her sophomore year, as she lowered her time in all of her events: the 100-yard backstroke, 100-yard freestyle, 200-yard freestyle and 50-yard freestyle. This season she’s topped those times yet again with a 58.57 in the 100 free, a 2:11.21 in the 200 free, a 1:12.28 in the 100 back and a 26.12 in the 50 free. She qualified for states in the 100 free and sectionals in the 50 free, both during the Dec. 14 meet against Randolph. Clark said it’s not just Navicky’s speed in the pool that makes her stand out, but also her willingness to lead by example, which is why she was recently named captain. Clark said he has no better recollectionof her leadership than from earlier in the year. Clark said Navicky’s leadership is just important as her point production. “She’s always trying to push it and go the extra mile, that’s why she’s a captain,” Clark said. “That’s how she’s always been, just always wanting to do a little better. She’s great with her peers. She never asks someone to do something she won’t do. Navicky said her goal is to continue to take her skills to the next level. “I’ve made so many friendships in high school that I think in college if I join a swimming team it will help me expand more and branch out and become more comfortable with everyone,” Navicky said. But she still has another year and a half donning red, orange and black, and she’s aiming high. Stevie Kelly calls out a play. The junior scored 10 points to go with six rebounds and six assists in the comeback win. Whitman-Hanson Regional High junior Stevie Kelly is known for his defensive prowess on the soccer field, but he’s making a name for himself on the hardwood at point guard. Kelly opened up his whole toolbox Friday night and the Panthers needed every bit of it to fend off Patriot League foe Silver Lake, 56-54. In a fourth quarter that the Panthers (8-2) entered down, 40-37, it was the 5-foot-10 Kelly, who scored five of his 10 points in the final frame to complement six rebounds and six assists on the night, right in the middle of the comeback. With 7:33 remaining, Kelly drained a triple from the top of the arc, evening the score at 40. 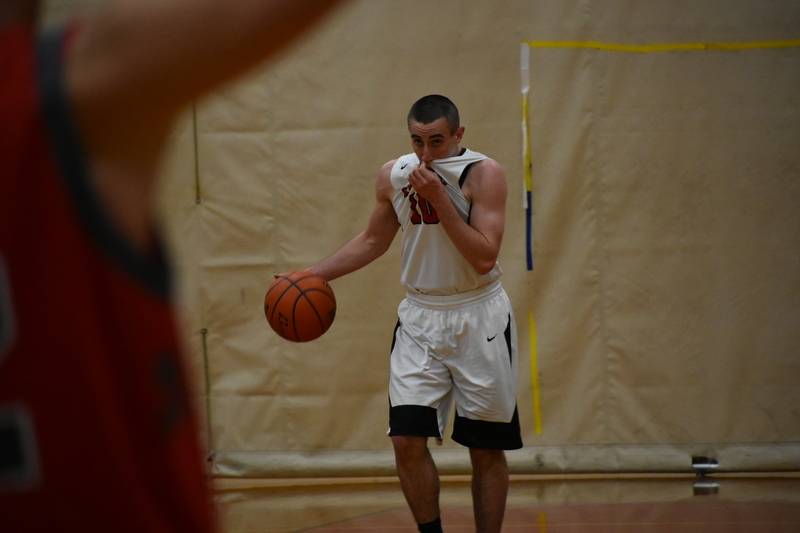 After senior Cole Lewis (10 points) shot the Panthers ahead, 49-47, with a pair of 3-pointers, the Lakers (3-5) would pull even before Kelly passed to a streaking Rian Schwede inside the lane and he laid it in for two. Clinging to a one-point lead late, Kelly jump cut into the lane for two, giving the Panthers a 55-52 lead, which was enough. With the help of six points in the first quarter from sophomore Cole LeVangie (team-high 16 points), the Panthers jumped out to a 18-10 lead after one. The Lakers proceeded to outscore W-H, 18-8, in the following quarter to claim a 28-26 halftime edge. Kelly sparked the Panthers out of halftime, motoring to the hoop for two, while picking up a foul in the process. His free throw put the Panthers up, 29-28. Later in the frame, Kelly drove into the lane and kicked it out to a wide-open Ben Rice on the right side, who drained a three, giving the Panthers a 37-35 lead. The Panthers will visit Hanover next Tuesday at 6:30 p.m.
“We just got to get tougher around the hoop and play harder,” Kelly said. Looking back on Week 5. In their only games of the week, the boys’ and girls’ basketball teams took care of business. 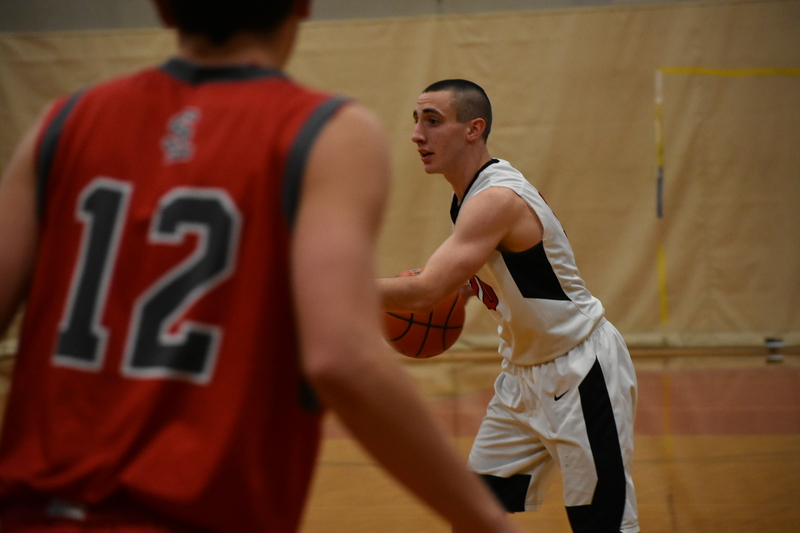 Boys’ basketball (6-2) downed Duxbury, 66-55, Friday, Jan. 4. Junior Ben Rice led the way with 24 points and sophomore Cole LeVangie added 14 to pace the Panthers. Girls’ basketball (5-2) edged Duxbury, 44-42, in a thriller Friday, Jan. 4. Senior Anna O’Neill hit the winning 3-pointer with 1:23 to go. Junior Brittany Gacicia produced a team-high 13 points to guide the Panthers to their fifth straight win. Boys’ hockey (4-4-1) opened its week by doubling up Cohasset, 6-3, Wednesday, Jan. 2. Freshman John Ward led the offensive outburst with two goals, while sophomore Kevin Willis, junior Chris Stoddard, junior assistant captain Adam Solari and senior captain Ed Scriven all added tallies. … On Saturday, Solari and junior Calvin Cooper struck for goals in the third but the Panthers fell to Quincy, 5-2. Girls’ hockey (0-5), despite a hat trick from junior captain Alyssa Murphy (Kingston), was nipped by Pembroke, 5-3, Saturday, Jan. 5. The Panthers drew within 4-3, but an empty-netter sealed the Titans’ win. Boys’ indoor track (2-1) bested Hingham, 51-48, Friday, Jan. 4. The 4×200 relay team of Sean Kukauskas, Billy Martell, Nic Fernandes and Pat Bui clinched the Panthers’ win. Other wins came from Brandon Hager (mile, 4:52.08), Martell (shot put, 40-foot-7), Kyle O’Brien (600m, 1:30.20), Theo Kamperides (2-mile, 10:40.60) and Kakauskas and Jake Caterer both tied for first in the high jump with 5-foot-2 leaps. Girls’ indoor track (0-3) fell to Hingham, 55-41, Friday, Jan. 4. Senior captain Ally Bartlett took first in the 55-meter hurdles (:09.64) and scored second in the long jump (14-foot-11 ½) and shot put (23-foot-7). Other winners included sophomores Isabelle Amado (1,000m, 3:14) and Anna Sullivan (mile, 5:58) and junior Tori Carleton (2-mile, 13:40). Gymnastics (0-5) fell to Plymouth on Friday, Jan. 4 by a 124.45-114 score. Senior Sarah Bombardier finished with a 30.1 all-around score to lead the co-op. Boys’ swimming/diving (2-2) fell to Hanover, 87-85, Thursday, Jan. 3. 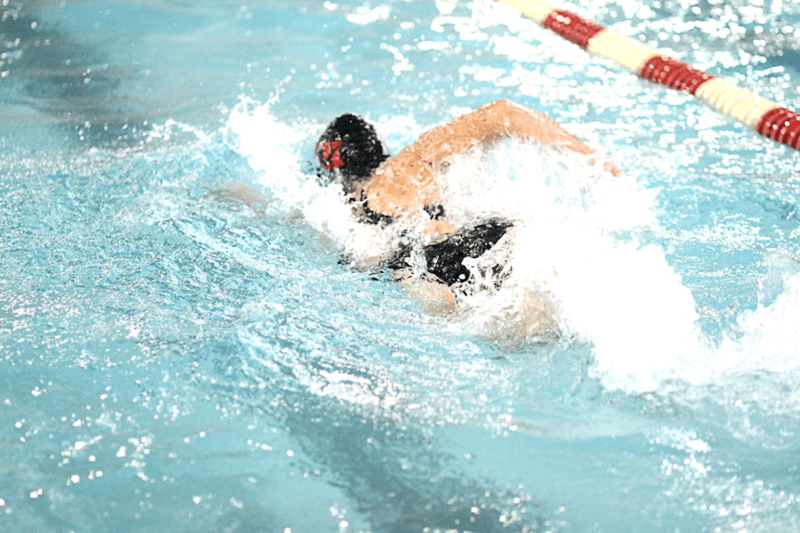 Girls’ swimming/diving (3-1) dropped its meet to Hanover also Thursday, Jan. 3 by a 94-88 decision. Sabrina O’Connor, Madison Navicky, Niki Kamperides, Abigail Bonney, Lillian Graham and Mariella Crowley performed well in the defeat. Wrestling (3-12) hosted its Panther Invitational and sophomore Damari Goldsmith-Greene placed third at 138 pounds. Anna O’Neill hits the winner as the Panthers knock off Duxbury, 44-42. It was a moment in the making. Anna O’Neill’s name has not been called on much this season. In fact, she didn’t play at all in the two victories posted by the Whitman-Hanson Regional High girls’ basketball team at the Hoosac Valley Tournament. But O’Neill got her opportunity Friday, and she made the most of it. With 1:32 remaining, the senior guard rose up and drained a 3-pointer from the left side of the arc to send the Panthers past Patriot League Keenan Division rival Duxbury and to their fifth straight win. “I knew she was going to get hot for us and she came up clutch for us,” said W-H head coach Jenna Olem. After a pair of Dragons misses from the charity stripe, senior Meg Henaghan sealed the win with an offensive rebound. W-H (5-2) trailed by as much as eight in the second quarter but cut its deficit to 25-23 at the half behind the scrappy play of junior Brittany Gacicia (eight points in first half). The Panthers gained a 33-31 edge heading into the fourth on a late 3-pointer by senior captain Kathryn Dunn. The Dragons (3-4) received a double-double from senior Sam Brennan (10 points, 14 rebounds) and 21 points from senior Teagan Curran. Olem noted she was impressed by the play of senior Leah Badger and junior Hannah Damon. The Panthers host Pembroke Tuesday at 6:30 p.m.
“They’re finally finding what their strengths are and understanding what their roles are,” said Olem. A look back on Week 4. 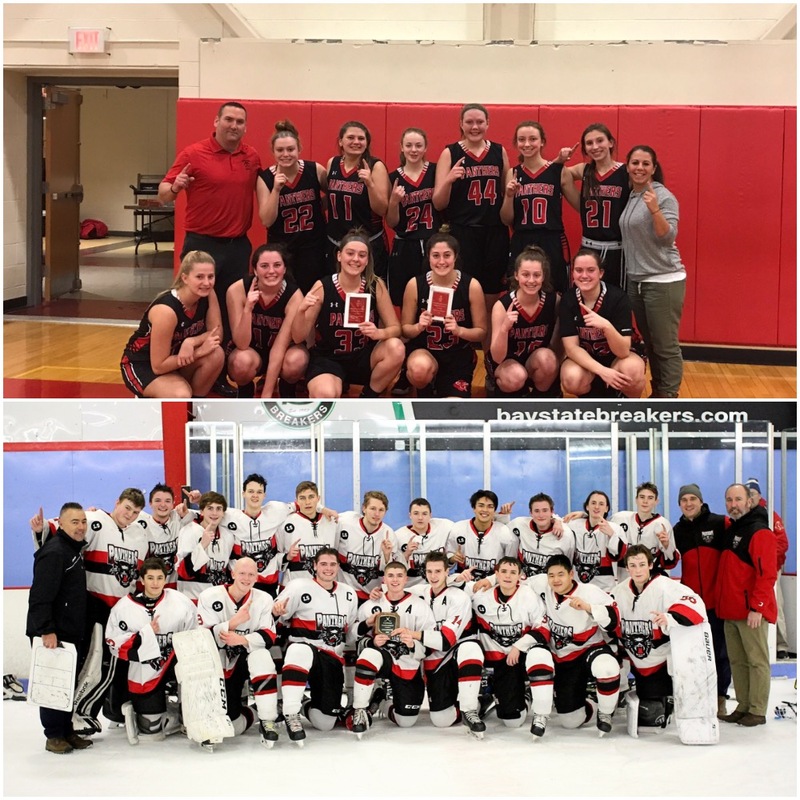 The Whitman-Hanson Regional High sports teams triumphed to a pair of tournament titles – one on the court and one on the ice – in a victory-filled Week 4. Boys’ hockey (3-3-1) defeated Cashman Tournament host Rockland, 3-0, in the first round Wednesday, Dec. 26. Junior Ed Collins sparked the offense with two goals and senior assistant captain Adam Solari had the other. Sophomore Bobby Siders earned the shutout in net. … On Saturday, the Panthers topped Southeastern/West Bridgewater/Bristol-Plymouth, 3-2, to take home their first Cashman Tournament title. Goals came from freshman John Ward, junior Chris Stoddard and senior assistant captain Owen Manning, and Siders collected the win in net. Boys’ basketball (5-2) collected two wins in its annual trip to Florida. After kicking off the Haines City Tournament with a 68-60 loss to Colonial High School (Fla.) on Thursday, Dec. 27, the Panthers rebounded for back-to-back wins. … On Friday, Bob Rodgers’ club, keyed by 26 points from junior Ben Rice, shot its way to an 84-75 victory over Archbishop McCarthy (Fla.). Senior captain Joey Depina and junior John Zeidan dumped in 12 points apiece in the victory. … Before staying for a few more days to soak up the sun, the Panthers capped their tournament schedule with a 63-57 win over Viera High (Fla.) on Saturday. Rice led the way with 13 points, totaling 53 over the three games en route to being named to the all-tournament team. Girls’ basketball (4-2), competing in the Hoosac Valley Holiday Tournament, rallied back from a double-digit deficit to knock off host Hoosac Valley, 51-46, in overtime Friday, Dec. 28. Senior captain Kathryn Dunn sparked the first-round win with 15 points, including a late 3-pointer to force the extra frame. Junior Liv Martin also had 15 points, 12 of which came from the 3-ball, in the win. … On Saturday, Dunn (tournament MVP) was at it again, netting a game-high 18 points, including the winning trey, as Jenna Olem’s club claimed the tournament title with a 42-38 win over Greenfield. Girls’ hockey (0-4), despite an offensive outburst, dropped a close one to Marshfield, 7-6, Thursday, Dec. 27. Junior captain Alyssa Murphy (three goals), sophomore Ellie Grady (two goals) and freshman Lily Ulvila (one goal), all of whom go to Silver Lake, sparked the offense. … On Saturday, the co-op lost to Archbishop Williams, 8-1. Freshman Abby Powers (Kingston) had the goal.